Dimensions (HxWxD): 4" x 2.6" x 1.5"
ON SALE: Was $398, now only $275. That's more than 30% OFF retail price. 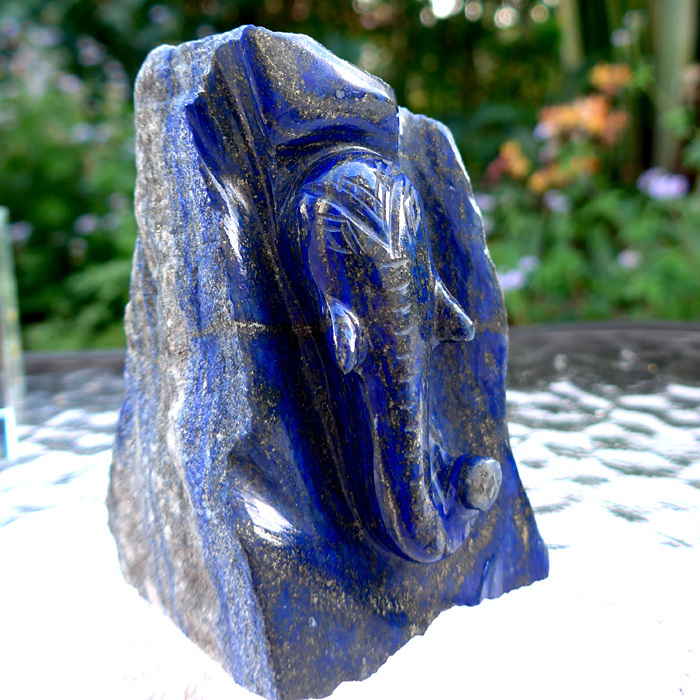 Meditators focused upon this beautiful 4 inch tall Carved Lapis Lazuli Ganesha Altarstone, weighing 629 grams or 1.4 pounds, will benefit from concentration upon the many Divine qualities of Ganesha, the Elephant Headed Hindu God of Success, also known as the Overcomer of Obstacles. The carved face of the altarstone is polished and the rest of the stone is unpolished, so you can see what this beauty looks like when it comes out of the Earth. Ganesha means Ruler of the Ganas in Sanskrit, the sacred language of yogis worldwide. The ganas were a group of semi-divine beings who were part of Lord Shiva's entourage, so Ganesha is said to be their Ruler, or Lord of Hosts. The word ganas was also used by philosophers and metaphysicians to refer to "all categories of created reality", so Ganesha is considered to be the Ruler of All Categories of Creation, and the patron Deity of wisdom, intellectual prowess and philosophy. According to the legend, Ganesha was the child of Shiva and Parvati. Ganesha, extremely devoted to his mother, was set the task of guarding her boudoir one day. Shiva had been away meditating on the icy crags of Mt. Kailash, the highest mountain in the Himalayas, for quite some time, and had not seen his child since he was an infant. Shiva returned home that day, and, anxious to see Parvati, tried to force his way through the door into her boudoir. 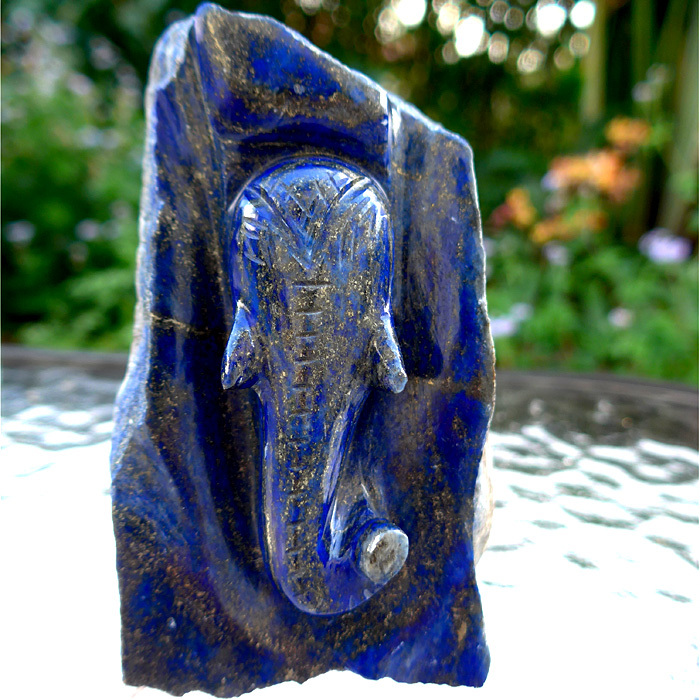 Ganesh stopped him, there was a fight, and Shiva struck off Ganesha's head with his Trident. Parvati was horrified, grief-stricken, and enraged, and demanded that Shiva immediately restore their son to life. Shiva commanded his servants to scour the world and bring him the head of the first creature they found so he could quickly restore Ganesha to the world of the living. The servants returned in a flash, with the head of an elephant, Shiva placed it on Ganesha's body, and the elephant-headed God assumed his familiar form. Ganesha in his reborn form symbolizes the many positive attributes of the elephant: long memory, intelligence, perserverance, patience, endurance, and overwhelming strength. The elephant is above all a gentle giant, a vegetarian, who never kills to feed. 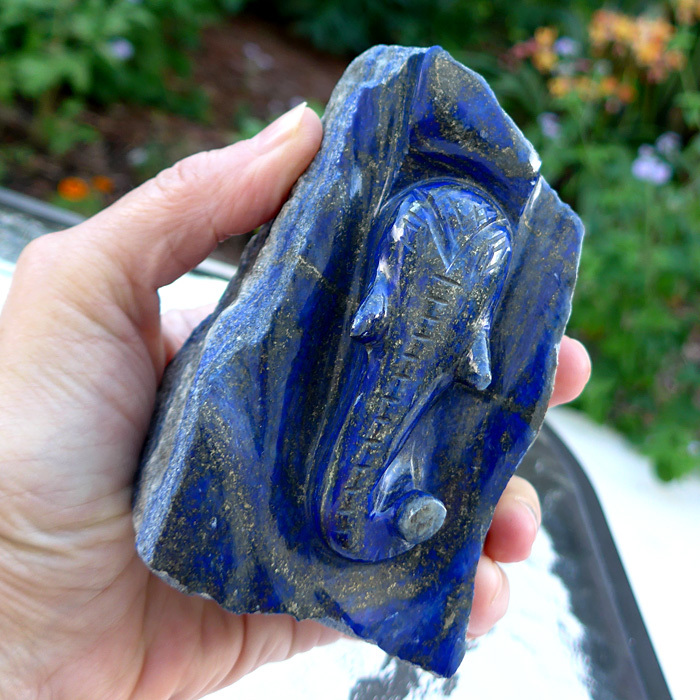 This Lapis Lazuli Ganesha carved altarstone has been cleaned with Universal Life Force Energy, and given an energy attunement using Reiki, a Japanese technique of energy healing, so it will continue to receive and transmit Universal Life Force Energy direct from the Source of Creation. It has also cleaned and charged with the natural energy of sunlight. It is ready for you to program according to your own needs and desires. The above weight is shipping weight. Net weight is 629 grams or 1.4 pounds.